I read Dorothy Dunnett's King Hereafter over several weeks, but I don't think I would say that I read it slowly. It's a long book with tiny font, with foreign words and subtle plot development, with larger-than-life characters and evocative landscapes. It's the sort of book you can't read too slowly because it takes some time to get into the rhythm of it, to remember everyone's names and their histories and their relationships to the other characters. So I would read it in bursts - 40 or 50 pages in a night being a "burst" - and then go to bed, exhausted but enthralled. In King Hereafter, Dorothy Dunnett's stage is the wild, half-pagan country of eleventh-century Scotland. Her hero is an ungainly young earl with a lowering brow and a taste for intrigue. He calls himself Thorfinn but his Christian name is Macbeth. In this novel, Thorfinn is a giant - he is taller than everyone around him, with a deep and gravelly voice. He's ugly, hardly ever smiles, and he rarely takes anyone else's advice. He's brilliant, like so many of Dunnett's other male characters are. He's also married to one of the most beautiful women ever, Groa, who has the great honor of being the newest entry (and the first new entry in years) to my Heroines Who Don't Annoy Me list. Groa is wonderful. She supports Thorfinn in everything, but she is also one of the few people who talks back to him. She's witty and well able to understand political intrigue, and she was, for me, the focal point of this whole story. What made King Hereafter so wonderful for me was this belief that Groa's role was so central to everything. 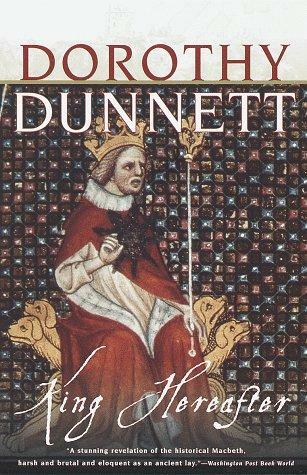 Dunnett always plays around with the ideas of destiny and fate and a person's ability to live on in story and legend. But here, we see that so much of this legacy was dependent on other people. It was, in fact, carried on by the women who survived their husbands, and the lessons they taught to children that had no fathers. Thorfinn was Groa's second husband. Perhaps she was happy with her first husband, and had no choice but to make the best of a bad situation with her second one. And that turned out very well, luckily, but how much was because Groa willed herself to be happy? When one is put in the position of always being vulnerable (as the heiress wife of a warlord inevitably will be), how many ways does she have of being in control of her own life? Groa personifies this throughout the book, through her initial fear of her new husband, to her growing love of him, and then with her acknowledgement that neither of their sons will ever be able to take his place. One day...I think the storms will subside and as nation settles by nation, there will be a place for quiet rule, and for building. Till then, it will be the fate of most leaders to die in their prime, and the fate of most women to carry forward their essence; their habit of mind; their spirit; their disciplines... Be grateful for that...You have sons. But, through Groa what there is of your kingship will pass on as in a lamp, where the flame is what matters, not the vessel. And the flame nothing can touch. This struck me so poignantly. As I sobbed my way through the rest of the book, I realized that this point was so true. So many women in the past have raised children on their own, left young widows to countless wars, famines, and accidents. And it's through them that so much of culture and stories and history and legend passed on. Thorfinn was brilliant and had high hopes for his country to become a beacon of education and wealth. He shared those hopes with his equally brilliant wife. And then, like so many others, he died. And another man came to claim her. Just as Thorfinn had known would happen. But his dreams and his feats and his personality were remembered by his wife, who loved him, and who had to carry on living and make the most of what life gave her. And so she got up, brushed herself off, and did her best to ensure that the future she and her husband had envisioned came to be. I'm reading this now and though I'm less than 200 pages into it, I love it already. I feel I'm progressing very slowly because of having to concentrate so hard on the unfamiliar names and complicated relationships, but like all of Dunnett's books it's definitely worth the effort. And I agree with you about Groa - she would be on my list of non-annoying heroines too, if I had one! Oh Groa. So, so heart-breaking, but so beautiful how Dunnett imbues her with precisely the kind of power a woman of that period could have. And she shows how in a way that power is even more significant than that of the men who come and go. Preserving the story and passing it along is real power.